My adventures through Goosebumps, Harry Potter, Jurassic Park, and Lord of the Rings gave way over the years to business books like Decisive, Contagious , and Made to Stick. My daily sci-fi for fun reading gave way to business blogs like Story Bistro, Web.Search.Social, and Stage Presence Marketing. I was stuck in a literary rut and didn’t know it. My work is based on having good ideas. Good ideas start with high quality assorted words. Aside from business topics I had a distinct lack of assorted words in my life. Then the Summer Reading Program banner caught my eye while I explored the business databases on the Poudre River Libraries website. Awesome, I thought, this would be perfect to get Ryland into using the library. Ryland is my 6 month old son. The next day I stopped into the Old Town Library. In addition to the program for teens, younger kids, and toddlers (or droolers in my case), the Poudre River Libraries also had a whole Summer Reading Program just for Adults. I snagged three of the checklists – one for me, one for my wife, and one for Ryland. The whole Summer Reading Program is built around “STREAM” education – Science, Technology, Reading, Engineering, Arts, and Math. Each week, there were new activities to try out (not to mention, some really cool edutainment activities for Ryland). We decided to tackle Ryland’s checklist first. Over a span of two months, we tackled 10 of the “reading” activities – “check out a book on Animals”, “attend a storytime at the library”, and “read at least 20 minutes today”. This part turned out to be super-easy, since we read to Ryland every night before bedtime – usually 4 or 5 kids picture books. For the adult checklists, we had to read 10 hours. I dedicated my reading time to (you guessed it) mostly business books. But I also snuck in a thriller. More on that later. Adding a whole slew of new library books to our collection has become one of our favorite weekly rituals. Ryland discovered some really awesome books along the way: Punk Farm (warning: singing and looking silly required, grungy English punk rock accent optional), A Penguin Story, Destructosaurus, Police Cloud, and Dinosaurs Love Underpants. Each library has a dedicated section just for kids complete with awesome puppets, toys, touch-and-feel books, board books, sing-along cds, and big picture books featuring just about any animal you can think of (great for finding stories about your kiddo’s favorite stuffed animal). When we completed the Reading activities section, we took our checklist in and Ryland got a cute, free board book as a prize! The “bonus” activities revolved around STREAM topics, you focus on one topic each week and then take the checklist to the library to get a sticker (which enters you for a chance at additional prizes at the end of the program). For Ryland’s Science task, my wife had Ryland experiment with bubbles. Because he doesn’t have a solid grasp on the concept of “wind” yet, we just tried to have him catch the bubbles and caught a few for him to pop. Ryland also tested the buoyancy of various objects in the tub and state changes of matter (we gave Ryland an ice cube outside and it melted in his hands). For my Science task, I visited two science-related websites. Stephen Hawking’s website, specifically to read up on Imaginary Time and NASA’s Jet Propulsion Laboratory website which features free pictures of awesome things in space. For Ryland’s Technology task, we had him tap pans, boxes, and the bathtub with wooden spoons to hear what sound they make. We also played music from Pandora and danced around. For Ryland’s Reading task, we attended a library storytime. Between the songs, the stories, and the Librarian fully committing to making sure the kiddos have a good time, I highly recommend this. We also picked up a book of nursery rhymes to read to Ryland. For my Reading task, I read a book from a genre I usually don’t read: thrillers. In this case, The Intern’s Handbook. This ain’t no goosebumps. For Ryland’s Engineering task, my wife made a simple ramp, and had Ryland roll objects down to the ground. We also helped him to build a tall structure of blocks until it fell. We talked a little about gravity but based on the amount of drool, I suspect it might be a conversation for another time. For my Engineering task, I read an article about robots: Extending Legal Protection to Social Robots. For Ryland’s Arts task, my wife made noise makers for Ryland to experiment with various sounds and had a jam session to Pandora’s Toddler Radio. We also took Ryland to a concert at Oak Street Plaza and Music on the Terrace at Front Range Village. 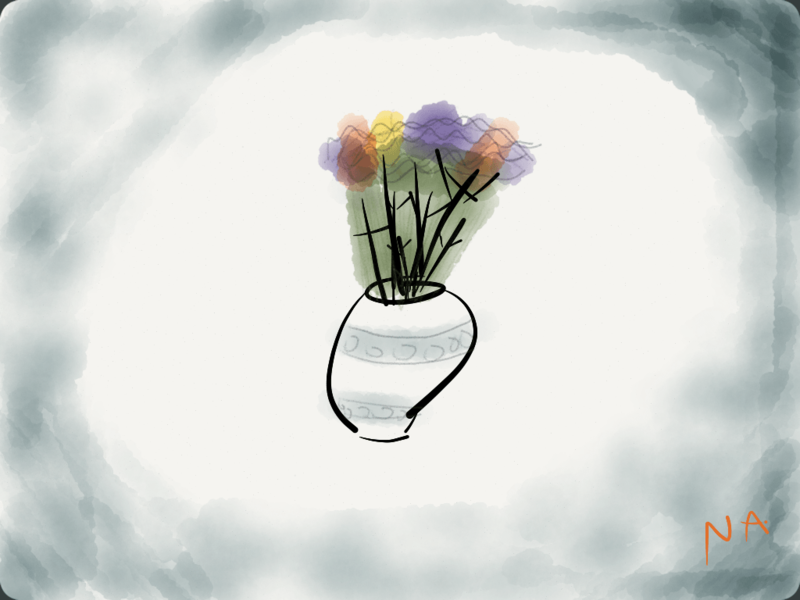 For my Arts task, I drew a picture using the Paper app on my iPad. Now, technically, I was supposed to draw a picture of a pet or family member, but I got tired of drawing stick figures. So, you get flowers. For Ryland’s Math task, we did a few simple counting rhymes like Five Little Ducks. We also got a set of soft blocks, built some towers, and counted the number of blocks. For my Math task, I completed a Sudoku puzzle. Participating in the Poudre River Libraries Summer Reading Program is ridiculously easy, fun, and something we’re planning on doing every year from now on. It’s created some new habits for us and opened up a whole slew of new book options for Ryland. Thanks Nick, you just gave me a host of wonderfully creative ideas to for our little grand-daughter when she is just a weeny bit bigger. Can’t wait. Love what you did with all these challenges and what a great initiative too. Sandy – you bet! You can download the checklists from the SRP website link at the end of my post. Loads of great ideas for little ones in there!